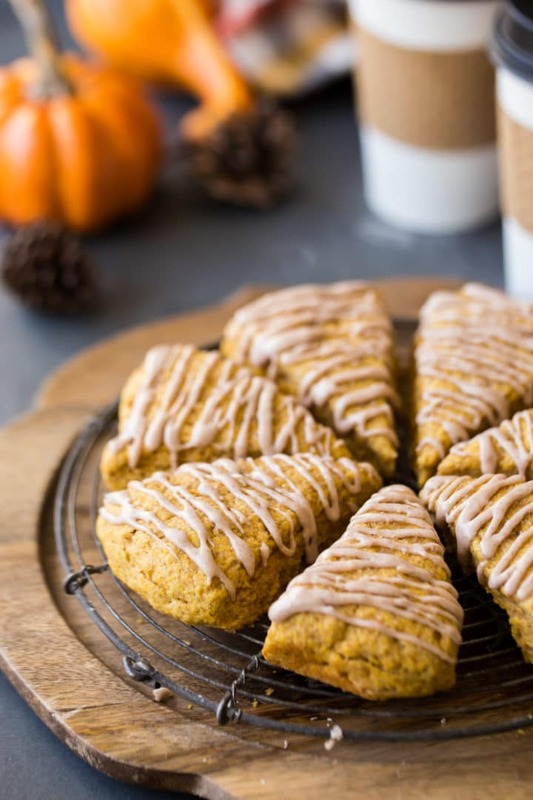 Bake up a batch of these easy pumpkin scones! Moist and tender, with earthy pumpkin and plenty of warm fall spice. So nice with your morning coffee! It’s that time of year! October is in full swing, and it’s all about the pumpkin, baby! So far this month I’ve shared Pumpkin Chocolate Swirl Cheesecake and Pumpkin Bread, and I’ve got TONS more pumpkin recipes from years past. 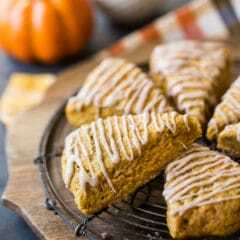 And today, I’m posting one of my all-time favorites: Pumpkin Scones! I am a total scone fiend. They are seriously my favorite kind of breakfast treat (even better than muffins, IMO! ), and I make them ALL the time. I love their moist yet toothy texture, and that hint of sweetness. They’re so versatile too- you can make them in all sorts of different flavors. And best of all, they are so quick and easy to make! Honest to goodness, you can have a freshly baked scone in 30 minutes or less! You’re going to love how easy this recipe is! The whole thing comes together so quickly! I used to always make scones by hand, cutting the butter in with a pastry blender. But then I discovered this food processor method, and I absolutely love it! The scones come out so perfect. They look smoother, and they are so incredibly tender. That said, if you don’t have a food processor, you can definitely make these pumpkin scones the old fashioned way. Start by combining the flour, brown sugar, baking powder, salt and spices. Then, pulse or cut in the butter until the mixture resembles coarse meal. In a separate bowl, whisk the pumpkin puree, cream, and vanilla together, and work it into the dry mixture. If you’re using a food processor, please be careful not to overdo this last step. The second you start to see the dough come together, you’re done! If you work it too long, the dough will become sticky and difficult to work with, and your finished scones could come out tough. Once your dough has almost gathered itself into a ball, transfer it to your prepared baking sheet, flour your hands, and pat it into a disk shape. Use a sharp knife to cut the circle into 8 equal wedges, and bake! Canned pumpkin puree tends to be really wet. It’s fine for things like pumpkin bread or pumpkin muffins, but in scones that extra moisture can create kind of a weird, bouncy texture. I prefer to drain as much of the excess liquid off as possible. Before you get started, just plop your pumpkin puree into a fine mesh strainer, give it a stir, and let some of that excess juice drain away. 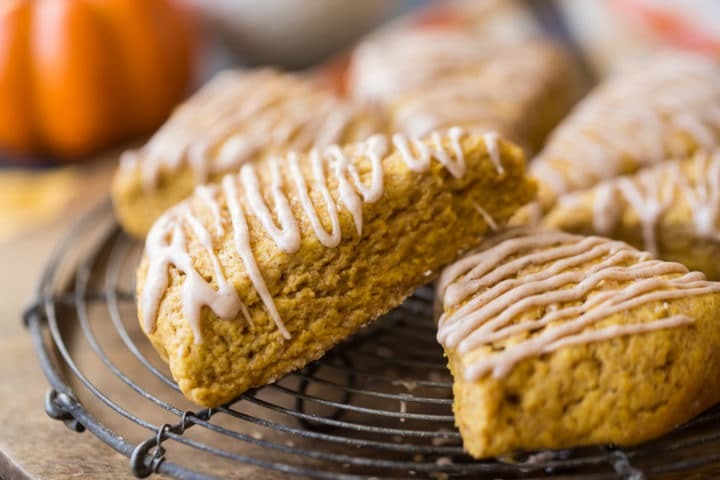 Your extra effort will be rewarded, with perfectly moist, tender, and crumbly pumpkin scones! HOW LONG DO PUMPKIN SCONES LAST? These pumpkin scones will keep at room temperature for around 5 days to a week. Keep your pumpkin scones in an airtight container. This way they’ll stay nice and moist and not get stale. You can freeze your baked scones in a zip-top bag. They freeze beautifully, and can be thawed at room temperature any time you want a special fall treat. To reheat your scones, just pop them into the microwave for about 15 seconds. Or, place them in a warm oven or toaster oven for about 5 minutes. The oven temp should be no more than about 170 degrees F, otherwise you’re re-baking, not re-heating! You don’t want to brown them or dry them out, just give them a gentle re-heat. 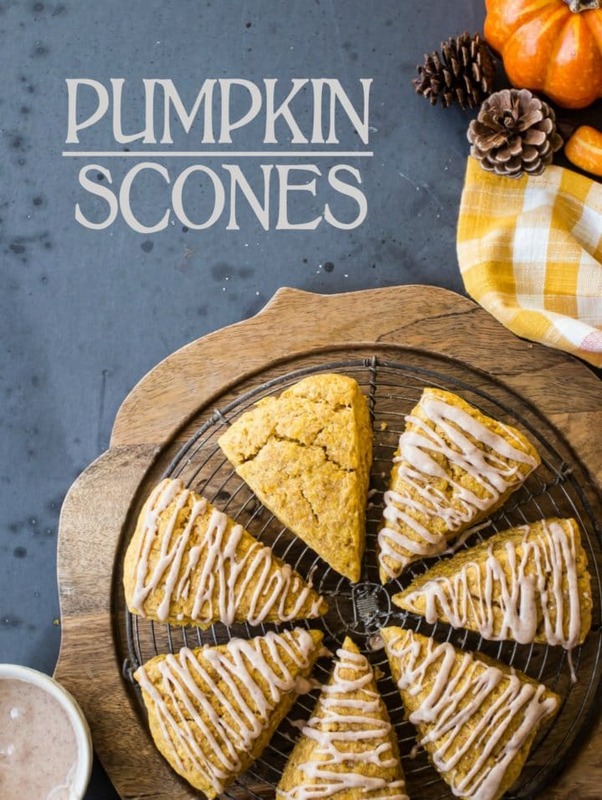 Give this easy pumpkin scone recipe a try! They’re moist, tender, and full of seasonal fall flavor. So nice with a cup of coffee, tea, or cocoa, and the best way to celebrate October! Preheat the oven to 375 degrees F, and line a baking sheet with parchment paper. Place the flour, brown sugar, baking powder, cinnamon, salt, ginger, nutmeg, and cloves in the bowl of a food processor, and pulse to combine. Add the cold butter to the dry ingredients, and pulse until the mixture resembles coarse meal. Whisk the drained pumpkin, cream, and vanilla together in a small bowl, and add to the dry mixture. Pulse together until a dough forms. With lightly floured hands, pat the dough into a flat disk on the prepared pan. Cut into 8 equal wedges, and pull them apart slightly. Sprinkle with raw sugar, for garnish (optional). Bake for 20 to 24 minutes, or until puffed and set. Place the powdered sugar and cinnamon in a small bowl. Drizzle over the baked and cooled scones. *1/4 teaspoon of pre-ground nutmeg can be substituted. Picture perfect scones! And they taste SO good! I just love scones so much! Need these in my life! The one issue I have with scones is that sometimes they are too dry, but that doesn’t appear to be a problem here at all! Yum! Hey Jenn! I think that would work great. Just be sure to use a GF flour blend that subs 1:1 for regular all-purpose flour. Good luck and I hope you and your daughter enjoy! What a delicious breakfast treat! Would be perfect with my morning coffee! Definitely need to make a gluten free version soon! WOULD THIS WORK WITH A BLENDER INSTEAD OF A FOOD PROCESSOR? I HAVE A BLENDTEC AND WONDERED. Sorry, I can’t say for sure as I have never tried that.